KowCast Ep 24 – Listener Q&A: Events … The Gimmicks Work! – Kow Cast! Your Kowabunga Comics Podcast. In this episode Eric and James dig in to a number of questions about current comic book events. 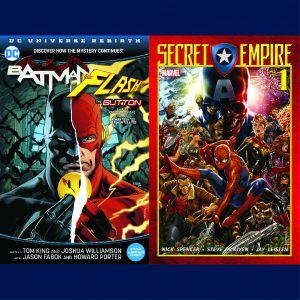 Hear how recent events from the big two have been met in our shop – Secret Wars, Civil War II, The Button, Justice League/Suicide Squad, Secret Empire, and more. We share how things have sold, what we believe has made for a successful launch vs a successful event, and other related feedback our customers have shared with us about these events.